“I miss him.” Geoff said, looking around the hall. “Or me.” Geoff took off his own faded jacket. He thought it was quite a spectrum as he hung his jacket up next to his wife’s fuchsia model. Uncle Jeremiah’s old jacket was probably older than most vintage cars. Stephanie’s up to the minute coat was probably worth more than most vintage cars and was absolutely right for a top flight barrister. His own humble raincoat was not as old as Uncle Jeremiah’s but was far more battered and had been bought only with practicality in mind. “What do you mean?” Geoff opened the door into the sitting room and wandered in. “Well, a list of what we need to do.” Stephanie followed him, automatically straightening some sagging cushions. “It all needs a deep clean and we should probably redecorate. This is a beautifully sized room with a great view of the garden and we could strip out all these bookcases and go for something more minimalist.” Stephanie trailed off as she checked the side table and adjusted an ornament on the mantelpiece. “It wouldn’t be the same.” Geoff said. He stood motionless in the centre of the room, an older, greying man with a nondescript sweater and faded jeans as his curated, blonde wife darted around the room, unable to stay still. “At least you called him.” Stephanie’s thin fingers clung to Geoff’s sturdy hand. “That would fit Uncle Jeremiah’s sense of humour.” Geoff helped his wife up and they wandered back into the hall. It was hard, going from room to room. Every room had a ghost of an argument and a swathe of happy memories. The study was the hardest. It seemed to have become Uncle Jeremiah’s living space, with a tray for his meals sat on a table near the door with a salt cellar perched in the corner. Photographs were everywhere you looked. Stephanie looked hard at the painting. 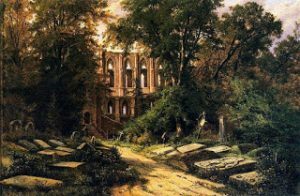 It looked nineteenth century, with dark, small leaved trees and sprawling shadows. Graves framed the path to a ruined church and it pulled you in to its sombre centre. “If Uncle Jeremiah was here, we would be having an argument right now about Romanticism versus Classicism and I would be quoting Byron and he would be talking about Tchaikovsky.” She swallowed a lump in her throat. “He said he was going to do that so I couldn’t dance on his grave.” Stephanie took a deep breath. Hardened barristers did not cry. “You are a genius with numbers, my darling, but you never worked out how Uncle Jeremiah’s mind worked. The grave is a red herring.” Stephanie lifted the picture down. It was surprisingly light and left dust marks across the sleeves of her silk blouse. “He would never give us a plain clue.” She turned the painting over. On the back was a small key and a nondescript envelope taped to the corner. She laid the picture face down on the desk and picked at the tape holding the key as Geoff worked the envelope free. “It’s numbers.” Geoff said, spreading out the slip of paper. Stephanie wasn’t paying full attention. The key was small but well made. She looked around the room and the large, mahogany desk had keyholes in its drawers. She found which lock the key fitted on the third attempt. “At least, it’s numbers but I don’t think it’s about the numbers.” Geoff said. Stephanie turned the key in the oiled lock and pulled open the drawer. It held a handbag, a beautiful, Hermes Birkin bag, in her favourite fuchsia pink. She picked it up and stroked the immaculate surface. The clasp moved easily under her fingers and nestled inside the perfect lining was a note addressed to her in Uncle Jeremiah’s spiky handwriting. “It’s a bank account number. I’m pretty sure it’s international.” Geoff said but Stephanie wasn’t paying attention. She unfolded the note. Behind her, Geoff was checking his phone. “It’s a Swiss account. We’ve found the money. Stephanie, we’ve found the money!” But she couldn’t answer. All she could do was choke back the tears as she hugged the bag.